If you like fashion, this is a must-have guide to shopping in Cincinnati! Filled with colorful pictures, popular styles, and insider tips from over 25 of the best independent boutiques in the area, you need this guide whether you're doing your holiday shopping, or just passing through the city. Covering shops carrying everything from contemporary designers, to vintage, to consignment, Style Tour explores the best of Cincinnati shopping! 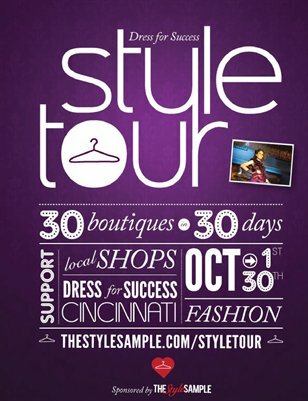 Best of all: All profits from the sale of the Style Tour guide are donated to Dress for Success Cincinnati!